Jaded Blossom: Guest Designer Dawn! Happy Tuesday! Two days til Christmas, I hope everyone is ready! It’s Dawn from www.kraftychick.blogspot.com. Today is my day as guest designer for Jaded Blossom. I am so excited! Thanks Candace and Michelle for this amazing opportunity. So cute! Love their faces!!! Eeeek! This is SO stinkin cute! 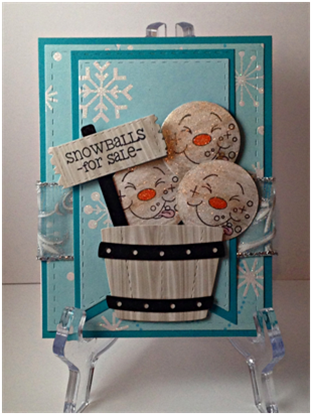 Love the faces on the snowballs and the awesome colors of this card! So stinking adorable! Love the faces! So clever! Cute! Love those super cute snowball faces!! eek...so cute!!!! I love snowmen!!! So creative! I love all the dies you used. Love your creativity with the tub and snowballs are so cute. This is too too cute! I love those snowballs! Adorable! Love your color choices! Love those faces! Will have to look into where to get them. OMGoodness those faces are adorable!! Great Job! Absolutely adorable! I love these adorable faces!